As I said in my previous blog, I love old stuff. 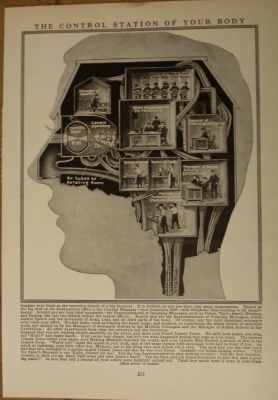 I found this great page of a human head on Etsy, and it is from the 1920's. I had to get it for it shows a very humorous picture of how you imagine the brain as a "big business". I especially love the camera men in the eye sockets. Hope you enjoy the picture as much as I did.